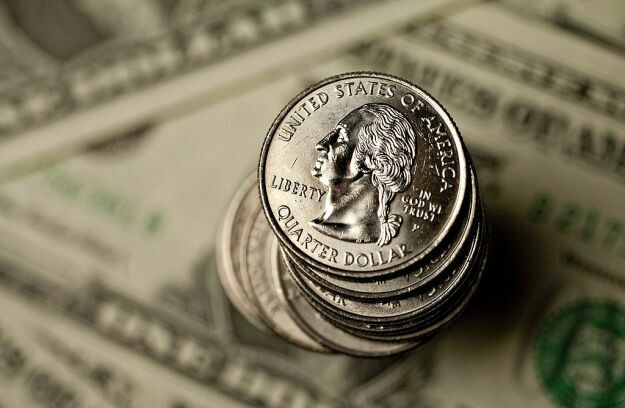 U.S. quarters and dollar bills. Big Law firms have been busy bumping up the six-figure starting salaries for newly graduated lawyers. But new data has reemphasized just how out-of-step salaries for local prosecutors and other public-sector attorneys are compared to those who opt for private practice. The median entry-level salary for public service attorneys is $48,000, or about one-quarter of what major firms pay to those fresh out of law school. Public service salaries have also remained nearly flat over the past 14 years that the survey has been conducted, with only a minor uptick since the survey was last conducted in 2014. That’s according to the findings of the National Association for Law Placement’s 2018 Public Service Attorney Salary Survey that will be released on July 2. The compensation contrast isn’t new. Lawyers in private practice, where corporations typically foot the bill for solving complex issues, have historically gotten far fatter paychecks. Taxpayers foot the bill for the personnel in the country’s criminal and civil justice systems. “It’s always a shock to see that public interest salaries are at such a low place, and that they are so stagnant,” said Steve Grumm, the executive director of the Lancaster, Pa., bar association. Earlier in his career, he conducted the NALP survey three times after it was first started in 2004. The survey queries the offices of local prosecuting attorneys, offices of public defenders, civil legal services organizations and public interest organizations. This year’s findings were based on responses from nearly 350 such organizations. Prosecuting attorneys and public defenders earn slightly more than other public interest lawyers. They draw a median $58,300 beginning salary. That increases to about $96,400 for those with 11 to 15 years’ experience. Local prosecutors typically start at $56,200 and rise to $84,440 after 11 to 15 years in the job. That compares to the newly announced $190,000 salary for first-year associates at major law firms. Five of the largest firms, including Shearman & Sterling, last week added their names to the list of elite firms which are adopting the new pay scale – plus hefty bonuses. Many associates in their eighth year at major firms will be bringing home $350,000 in compensation plus a $25,000 bonus. The NALP public interest pay scale will be available online at www.psjd.org starting July 2. The idea is to help inform students who are deciding whether to choose public interest work for their legal career. Many students emerge from three years of legal education with six-figure debt, which requires high monthly repayments. Last year, fewer students chose public interest law as a career, according to the American Bar Association’s tracking of lawyer placement for the class that graduated in 2017. Among the nearly 26,300 new J.D.s, entry-level hiring dropped 1.2 percent in the public interest sector, according to the ABA data. However, such hiring also dropped in government, with a 5.7 percent decline. Business and industry saw a noticeable 15.4 percent decrease and hiring in academia fell 18 percent. Law school graduates choosing a public interest career path have to factor in stagnant salaries, but their compensation is slightly better than it was between 2008 and 2014 when state and local government budgets were making serious cutbacks in government jobs due to lower tax collections. In recent years, median salaries have picked up for several public service attorney categories, including local prosecutors. But those salaries still remain far lower than even firms that are far smaller than the most elite firms which can have thousands of lawyers. The median first-year salary, for example, at a firm with fewer than 50 attorneys was about $90,000 last year, according to NALP figures. That is “not quite double the salary for an entry-level attorney at a legal services organization,” the survey found. And as the size of the firm grows, so do the salaries. The starting salary for a firm with between 51 and 100 attorneys was $115,000. “The starting salary paid at many large firms in big cities is beyond what even the most experienced attorneys can reasonably expect at a public interest organization,” the report concluded.